Mommy Moments: Chore Time | To Be, To Be. Tutubi. This week's Mommy Moments theme is Chore Time. I agree very much with Chris that we must teach our kids responsibility and one way of doing that is by letting do some chores. We don't have a maid and we things on our own so my kids really do their share. 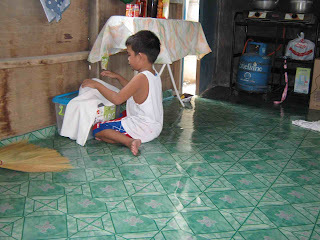 Here is my eldest helping to fold dry clothes after the Ondoy flood. Of course, his grandmother always help him when she sees him doing this. But he knows that he must stay until the chore is done before he can leave and play. My second child, Danniel also helps with watering the plants, sweeping the floor and arranging the dishes. In the picture below taken in our Montalban house, he was folding the cloth we used to wipe the plates. My youngest child Ishi loves helping me with the laundry. She would always sit by my side and tells me that when she is bigger, she would do it by herself and I can just read! And I find that too sweet of her! Of course, there are times when you cant make kid do these chores without threats or favors. But most of the time, when I assign them something to do before I go to work when they dont have classes, they cooperate. Then when I get home, I would hear stories of how good they were and that I should let them play with PSP or my laptop. And I am always willing to reward them. So this works well for all of us. Its great that you have helpful kids. And what a nice trade-off you've got going there. Happy MM! hahha my son like that once in a while. Nice MM! Am playing too. its great that your kids grew up helpful and knowing their responsibilities! kudos mommy!